Kyabje Lama Zopa Rinpoche explained how delusion and karma bind us to samsara, at the 11th Kopan Course in November 1978. This teaching is an edited excerpt from Session 38, Section Seven of the course. 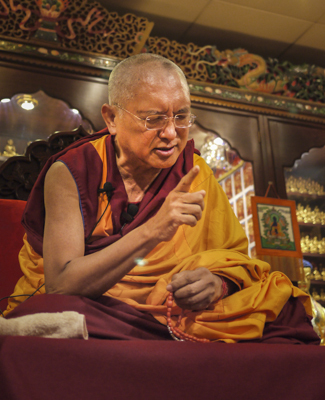 Lama Zopa Rinpoche teaching in Singapore, 2010. Photo by Thubten Kunsang. In order to achieve tranquil abiding or shamatha, our mind needs to be devoid of the hindrance of sluggishness—the Tibetan term is chingwa. Sluggishness is chingwa and fogginess is ngookpa—another term for when we are close to the state of sleep. If we are not mindful and conscious, the realization of tranquil abiding or shamatha cannot be achieved. So, in order to achieve shamatha, we should be mindful and conscious.